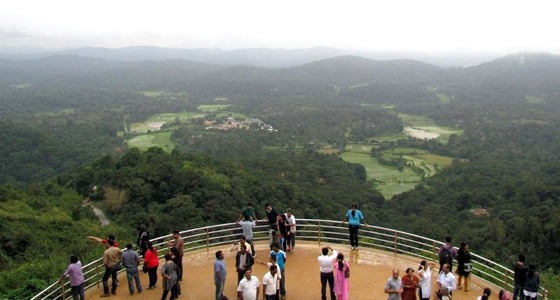 Coorg a tiny district in the state of Karnataka, is often called the “Scotland of India” for it’s lush green beauty, rolling hills and valleys, forests, lakes. The term was actually given by Scotsmen, who began the coffee plantations there, as the place reminded them of their native land. Nestled in Karnataka’s Western Ghats, it was actually a separate Coorg state, before it was merged with Mysore in 1956, during the States Reorganization. While very much a part of Karnataka, the region maintains its own distinct identity. Though Kannada is the official language, the inhabitants mostly speak Kodava, Tulu and Arebashe. The Kodavas, take pride in their martial traditions, carry guns, and their most famous dish is a mixture of steamed rice balls and pork curry. Known for it’s huge coffee plantations, it is one of India’s leading coffee producers. It is the place where the Kaveri originates at Talakaveri, and every year thousands of tourists visit the region, to experience it’s natural beauty, forests, waterfalls and hills. It has one of the grandest Dussehra celebrations on par with Mysore. It is a region, known for it’s high literacy rate, where education is given a priority. Considered as the cradle of Indian hockey, the region has given some outstanding players like M.P.Ganesh, M.M.Somaiyya, S.V.Sunil, as also champion athletes like Aswhini Nachappa in athletes, Rohan Bopanna in Tennis, Ashwini Ponappa in badminton and Robin Uthappa in cricket. In the tinsel word, some of the leading Kannada actresses like Prema, Daisy Bopanna. But above all, the region has given some of the finest defense officers to India, Gen.K.S.Thimmayya( Chief of Army Staff), A.C.Iyappa, first Signal officer in chief and also first chief of BEL, Major Mutthanna, CD Subbaiah to name a few. In this beautiful region, with a proud history, and a rich culture, was born one of Coorg’s greatest sons in the picturesque hill station town of Madikeri on Jan 28, 1900, just as the world was beginning to enter the 20th century. Kodandera M Cariappa also known as Kipper, the first Indian Commander in Chief of the Indian Army, the only other Indian officer to hold the rank of field marshal, along with Sam Manekshaw. The second of four sons of Madappa, a clerk in the revenue department and Kaveri, he was made to take an oath by his mother at a small age that he would always work honestly and never take a bribe. That penchant for integrity is something that would be an aspect of his very distinguished career. Affectionately known as Chimma, he had his early schooling in Madikeri, where he learnt horse riding. It is said he once tamed an unruly horse, by riding it again and again, even when it threw him off the back. Coming from a region that was proud of its martial heritage, Cariappa imbibed the spirit and ethos of the place. He was just 15 when World War I, broke out, but keenly followed every news about it , using a map. When studying at Presidency College, Chennai, he came to know that the British Government would select young Indians for the Army, and that the training would take place in Indore. Fifty youngsters were to be selected, and Coorg( which was a separate state then), had just one seat. Cariappa applied got that seat, and his training began In June 1918. While he graduated in December 1919, Cariappa got only a temporary commission. He only got a permanent commission in 1922, which was done deliberately to make him junior to the British officers who had passed out from Sandhurst in July 1920. What this effectively meant, was that though Cariappa had passed out earlier, than the Sandhurst officers, he was deliberately placed down the order. It was a typical case of British high handedness and discrimination. Joining as a 2nd Lieutnant, he became a Lieutenant in 1921, and served in Mesopotamia for some time. In India he was transferred to the 7th Rajput Regiment, which after independence became the Rajput Regiment, and also Cariappa’s permanent regimental home too. In 1925, he went on a tour of Europe, US, Canada and Japan, which proved to be a learning experience for him. He also got the nickname of Kipper, by a British officer’s wife who found it hard to pronounce his name. Cariappa again came face to face with the discrimination, when in spite of being the first Indian officer to get through Quetta Staff College entrance examination, he was denied a staff appointment for two years, contrary to the existing procedures. During this time, he rendered service on the North Western Frontier Province, where he had to take on the dreaded tribesmen, known for their guerilla tactics. Displaying exemplary bravery, he protected the convoys many a time from their ambush attacks. Finally in 1936, Cariappa, was appointed as staff captain in the Deccan, two years later he was promoted to Major and appointed as Quarter Master General. Cariappa was one of the early officers to raise the issue of discrimination of Indian officers in the army, and the treatment meted out to them. He stressed the discrimination shown towards Indian officers in promotions, allowances, benefits before the Skeen Committee in 1939. When the War began, he was posted as Brigade Major to 20th Indian, stationed in the Derajat region of Pakistan. Later he was appointed as Dy. Assistant Quarter Master General( DAQMG) of the 10th Indian division in Iraq. Between 1941-42 he served in the Middle East, primarily in Iraq, Iran and Syria, and later in Burma between 1943-44. In 1942, he became the first Indian to command a battalion, when he was appointed as CO of the newly formed 7 Rajput Machine Gun Battalion in Fatehgarh. He managed to stabilize the newly raised battalion, train it, in fact this is where he earned his administrative spurs too. Two major initiatives undertaken by him, were to replace the machine guns in battalion with tanks and next it was moved to Secunderabad, amidst protests by unit members which he deftly handled. Though he wished to serve in active combat, circumstances did not favor Cariappa. However he was posted as AQMG of the Eastern Command in Burma at Buthidaung. This was the division that pushed out the Japanese Army from Arakan, and Cariappa was given an OBE( Order of British Empire) for the role played. In November 1945, he was put in charge of the Bannu Frontier Brigade in Waziristan, and it was during that time, Colonel Ayub Khan, who would later become the President of Pakistan, served under him. Dealing with the hostile tribesmen there, Cariappa adopted a carrot and stick policy, extending friendly relations with them, using force where necessary. A stickler for fairness, Cariappa, was known for his treatment of the captured INA prisoners. When he saw the miserable conditions under which they were living, he immediately wrote to improve them, and also grant them amnesty. He had the foresight to point out that the INA officers had support from the Indian political leaders, who would sooner or later rule the country. He was against the partition of Indian Army as he felt it would have a devastating effect, with inexperienced Indian officers in higher positions. However he had to deal with it, and handled the division of the Indian Army, sharing of assets between India and Pakistan, quite well. Cariappa was initially appointed as Dy. Chief of General Staff, however with the situation in Kashmir worsening, he was made as GOC in charge of East Punjab Command in 1947. He renamed it as Western Command, moved the HQ to Jammu, and raised a corps HQ under Lt.Gen S.M.Sriganesh at Udhampur. He also appointed Lt.Gen K.S.Thimayya as the GOC for Jammu and Kashmir and Atma Singh as GOC for Jammu division. 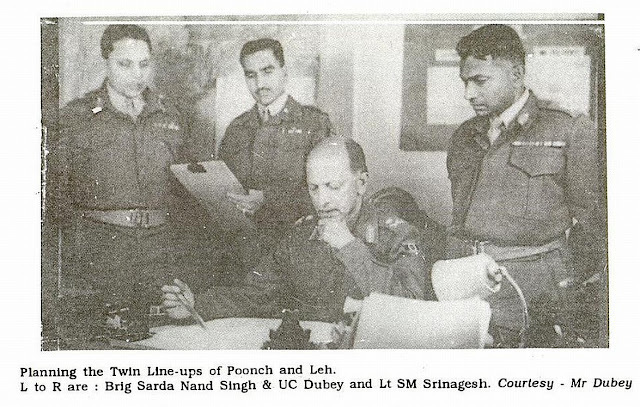 Leading from the front, Cariappa launched three operations- Kipper, Easy and Bison, to capture the Naushehra, Poonch, Zozilla, Dras and Kargil areas. He managed to beat back the Pakistani forces, and was actually on the verge of driving them out of the valley. However thanks to Nehru taking the issue to UN, and subsequent intervention, it was not carried out. Cariappa protested against this saying that Leh, Kargil, the Valley would be at a great security risk. Disregarding orders, he launched strikes in the Ladakh area and allowed India to take control over that region. When Lt.Gen Sir Roy Butcher’s tenure as Commander in Chief was expiring in January 1949, it was decided to replace him with an Indian officer. Along with Sriganesh and Nathu Singh, Cariappa was one of the contenders for the post. The then Defense Minister wanted Sriganesh to take over on grounds of seniority. Though Sriganesh was 6 months senior, Cariappa had the longer period of service. Both of them declined, and K.M.Cariappa became the first Indian commander in chief of the Army. The date on which he took over, January 15 is now widely observed as Army Day. As the chief, Cariappa, was instrumental in formation of the Territorial Army in 1949, and also played a role in the evolution of NCC. He also adopted Jai Hind, and soon it became a formal greeting among officers in Indian Army. He turned down the proposal for reservations in the Army, as he emphatically stated it would affect the quality of the personnel. Finally on January 14, 1953, Cariappa retired making a farewell visit to his beloved Rajput Regiment, which he served for a long time. Even after retirement, he still continued to serve the nation in one capacity or another. He served as the High Commissioner to Australia and New Zealand from 1953-56, set up the ex-Servicemen’s league( ESL) in 1964, established the Directorate of Resettlement to look into issues of retired defense personnel, especially those who came out at a younger age. He helped in reorganization of armed forces of many newly independent nations, was given the Legion of Merit by US President Harry Truman. However his brief foray into politics was a failure, when he lost in the 1957 General Election as an independent candidate. 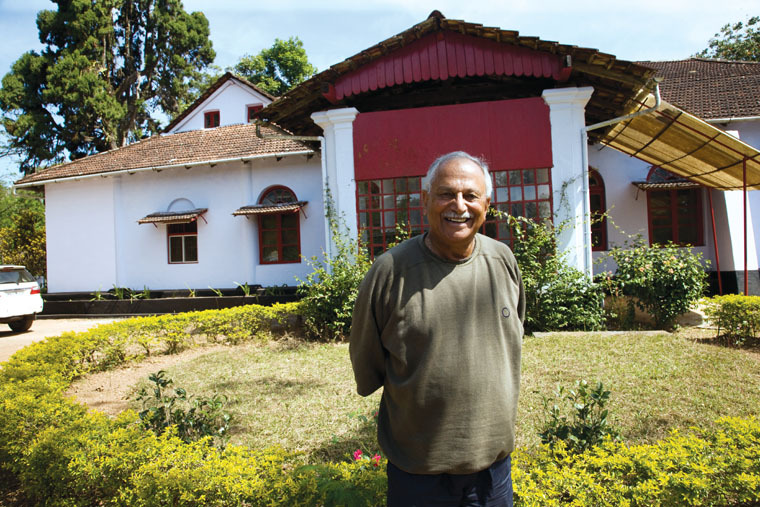 Roshanara, Cariappa’s ancestral home at Madikeri. Sadly he had a troubled married life , and his marriage with Muthu came to an end in 1945, when the couple separated. His son K.C.Cariappa served in the Indian Air Force, during the 1965 War and was in fact taken as prisoner. There was an interesting anecdote when General Ayub Khan, who was the President offered to release his son. Cariappa, shot back saying “The POWs are all my sons, look after them well”. He was a stickler for integrity and honesty , never misused his power and status, ensured his children also followed the same. This true hero, a man of integrity, finally passed away in 1993 at Bangalore, but not before leaving a rich legacy. This entry was posted in 1947 Indo Pak War, Great Indians, Indian Army, Modern India and tagged 1947 War, Cariappa, Indian Army. Bookmark the permalink.